A. J. Jacobs is a writer and journalist with a rather unusual method of getting his stories. He is not content just to research whatever subject he happens to be writing about. He immerses himself in the subject, actually living out his project to the point of obsession. As it turns out, while doubtless a lot of trouble to his wife and friends, this approach does lead to his writing books both interesting and humorous. His first such book, The Know-It-All chronicled his quest to read the entire Encyclopedia Britannica, while his second book, The Year of Living Biblically, told of his attempt to live his life according to all of the rules of the Bible for a year. These aren’t the only experiments that A. J. Jacobs has conducted upon himself. 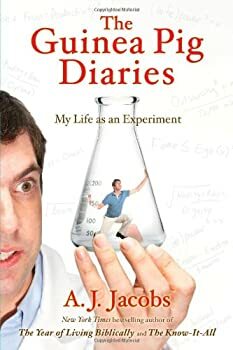 He has compiled some of his minor projects in a book titled The Guinea Pig Diaries. One of these projects, and the subject of this post, is a concept called “Radical Honesty“. Radical Honesty is a technique developed by a psychotherapist named Brad Blanton. Radical Honesty is just what the name might implies. Dr.Blanton teaches that we should always be completely honest with one another. This might not seem to be a particularly new or radical concept, sages and moral teachers have been telling for centuries that we ought not to tell lies. Dr. Blanton takes the idea further, however, by insisted that we should always be honest. We shouldn’t tell those little white lies that help to smooth our relationships with others. If your wife asks if the dress she is wearing makes her look fat, say, “yes”. If you don’t want to go out to dinner with a friend, say so and don’t make up, “other plans” or imaginary headaches. If you find yourself desiring your friend’s wife, say so. In fact, Dr. Blanton believes in simply removing the filter between what we think and what we say and do. Is this a good idea? Well, we should be honest in our dealings with others. As a matter of justice and charity, we ought not to take advantage of people by deceiving them. Honesty, by itself, is not necessarily always necessary or desirable. Honesty is a virtue when it serves the greater virtues I mentioned. It is not necessary to be honest if being honest leads to an evil outcome. It is not necessary to tell the Nazis that you are hiding a family of Jews in the attic, or to tell the robber where you have hidden your money. Even Dr Blanton agrees with this. It is also not necessary to tell the truth if doing so will lead to hurt feelings.You do not have to tell your wife she looks fat and you probably shouldn’t tell your friend you desire his wife. No good can come of such confessions. There is a subtle line here, though. A. J. Jacobs wrote of an old widower who sent him some poetry he had written and asked Jacobs for his opinion of his writing. Jacobs didn’t think the poems were very good, but wrote an encouraging reply. He could not bring himself to tell the man he though the poems were badly written. Ought he have told the truth about his Opinion. Dr. Brad Blanton thought he should have. He argued that he was not, in fact, doing the man a kindness by lying to him. If his poems weren’t much good, he ought to be told the truth so he wouldn’t waste his time trying to get them published. I sort of agree with Dr. Blanton. Back when Simon Cowell was on American Idol, he was generally disliked for his cutting criticism of the contestants’ singing, especially during the tryouts. This seemed to be very cruel, yet perhaps he was doing them a kindness by showing them that they lacked the talent to sing professionally, and that they would be well advised to try something else. Perhaps the real cruelty would be to encourage someone to follow a path you know they have no ability to complete simply to spare your own feelings. Perhaps. I cannot help but feel that what Dr. Blanton has really done is that he has discovered a way to be obnoxious to his neighbors and to have avoided the usual consequences by pleading that he was just being honest. In any event, I am not convinced that getting rid of the filter between the brain and the mouth is such a good idea.A. J. Jacobs was not convinced either, as he explained while describing his life as George Washington. That was another one of his projects. Jacobs did not go about dressed in a colonial costume. Instead, he decided to try to live up to George Washington’s Rules of Civility and Decent Behavior. The thing that most impressed Jacobs while studying the life of Washington was the tremendous restraint the Founding Father displayed over his emotions. By nature, Washington was a passionate man with a fierce temper. In his youth, he was a rather arrogant, entitled aristocrat who flattered his superiors in person while undermining them behind their backs. Yet, Washington possessed the strength of will to remake himself into a model of decorum and decency. George Washington was supposed to be unable to tell a lie in the famous legend, but I somehow doubt he would think much of Radical Honesty. If Dr. Blanton advises us to remove the filter, Washington spent much of his life creating the filter and making it stronger. I think the idea behind Radical Honesty is that we ought to be “authentic” or “natural”. Washington would disagree. If he had acted authentically and according to his basic nature, Washington would have remained just another Virginia planter and we would still be a colony of Great Britain. The simple truth is that civilization depends on people restraining their impulses and not doing and saying whatever comes naturally. I said civilization, but I shouldn’t have. The members of any society of human beings, no matter how primitive, must learn to restrain their more selfish feelings and work with the other members of their group. Jean Jacques Rousseau’s ideas about “noble savages” who lived entirely with nature were myths. If anything, a tribe of primitive hunter-gatherers would have to have even less tolerance for individual eccentricities than a modern society. I think we are losing this idea of restraint. Any impulse felt must be acted upon and someone else will clean up the mess. I wonder where it will lead us. Nowhere good, I imagine. I guess the only thing I can say about Radical Honesty is that being honest is a good thing, being radically honest may not be. What’s So Bad About a Boy Who Wants to Wear a Dress? (rss.nytimes.com) How is Zemanta deciding what are related articles? Only one of the articles listed has anything to do with this topic! The presidential election of 1796 was the first real election for president that the United States had. In the first two elections, the elections of 1789 and 1792, everyone knew that George Washington was going to win. He had no opposition and it was simply inconceivable that anyone would run against him. Washington’s second term was not as successful as his first, especially in foreign policy. The young nation was being pressured to take sides in the war between Great Britain and Revolutionary France, and Washington’s insistence that the United State was neutral pleased neither side. The British would not respect American sovereignty while the French ambassador tried to undermine the government. Washington sent John Jay to Great Britain to negotiate a trade treaty and to deal with these issues. The resulting treaty was greatly to the advantage of the British and was very unpopular, especially among the supporters of Jefferson. This affected Washington’s popularity and in the second half of his second term, Washington faced more public opposition than he had before as president. Still, if George Washington had wanted a third term, he would have gotten it. He didn’t want it. Washington was feeling old and tired. He was 64 years old and had lived a hard life. He was also aware that the men of his family tended to die young. Washington wanted to return to Mount Vernon and spend a few years in retirement. As soon as it was clear that Washington would not serve a third term, the race was on. The first party system had begun to develop in George Washington’s second term. The party organizations were still rather rudimentary, however and there were none of the primaries, caucuses, or nominating conventions that were a feature later on in American politics. Instead the leader of each party met informally and chose candidates. Both parties decided to balance their tickets geographically with one candidate from the north and one from the south, in order to appeal to the whole country. The Federalists picked John Adams to be their candidate for president. He had served as vice-president for eight years under Washington and many felt that he deserved the top job. Adams was known to be capable and honest and was a good choice. For vice-president, the Federalists chose Thomas Pinckney from South Carolina. Pinckney is not well known today. He had fought in the Revolutionary War and had served as governor of South Carolina from 1787 to 1789. He was Washington’s minister to Britain in 1792 and had negotiated the Treaty of San Lorenzo with Spain. In fact, the Federalist Party leader, Alexander Hamilton preferred Pinckney to Adams and tried to arranged for him to get more electoral votes. The Democratic-Republicans chose their party leader, Thomas Jefferson. For vice-president they decided on Aaron Burr from New York. This might seem a strange choice considering Burr’s later notoriety, but Burr was also a Revolutionary War veteran and a prominent attorney. He was also the leader of the Democratic Republican Party in the state of New York. The rules for electing the president were different before the passage of the twelfth amendment. The electors were selected in November either by state legislatures or in some states by popular vote. When the Electoral College met, each elector had two votes which he cast for two different men. The candidate with the most votes was elected president while the runner up got to be vice-president. This system worked well enough in the first two elections, when everyone knew Washington would be president. It did not work so well in the election of 1796 and caused a crisis in the election of 1800. The first contested election was fiercely fought. Adams and Jefferson took no part in the campaign, it wasn’t considered seemly to actively campaign in those days, and they remained friends. Their partisans, however, attacked each other mercilessly. Adams was accused of being a monarchist who planned to make himself king and his sons lords. Jefferson was attacked as a fanatic Jacobin and atheist who wanted to import the French Revolution to America. When the votes were cast, Adams won by a narrow margin. He got 71 electoral votes, winning all of New England along with New York and New Jersey. Jefferson had 68 electoral votes, winning the entire south including the new states of Kentucky and Tennessee and also won Pennsylvania. In the states of Pennsylvania, North Carolina and Virginia, one elector had voted for Adams, while Maryland was split with seven votes for Adams and four votes for Jefferson. In both parties the plan had been for all but a few electors to cast their second vote for their party’s choice for vice president, thus allowing either Pinckney or Burr to be in second place. This didn’t work out because of the slow speed of communications at the time, so the electors’ second votes were distributed among a variety of men. Thomas Pinckney got 59 votes, fewer than Jefferson. Burr was a distant fourth with only 30 votes. So John Adams, the Federalist was elected president with Thomas Jefferson, the Democratic Republican as his vice president. This might be a little like Barack Obama having John McCain as his vice president. Despite the differences in party, Adams and Jefferson expected to work well with each other and Jefferson was gracious in defeat, saying, “Adams has always been my senior from the commencement of my public life”. Maybe he had an idea of just how rough the next four years were going to be. The election of 1792 was, in many ways, a repeat of the election of 1789. There were the same candidates and the same result, Washington winning by a unaminous vote of the electoral college and John Adams being re-elected Vice President. George Washington really didn’t want to run for a second term. Although his first term had been very successful, Washington had not enjoyed it. He wanted nothing more than to retire from politics and go back to his home at Mount Vernon. One thing that had especially exasperated Washington was the growth of partisan politics in the new republic. None of the founding fathers had anything good to say about political parties and they all warned of the dangers of factions. Despite these warning, the first party system was already forming around Washington’s two chief cabinet officials; Thomas Jefferson and Alexander Hamilton. Both of these men were very intelligent and ambitious. Both of them had grown up without a father, Jefferson’s dying when he was 14 and Hamilton’s abandoning his family. In all other ways, however, the two men were opposites and rivals. Alexander Hamilton favored a strong federal government. Since he had been born outside the thirteen colonies, he had never developed any intense loyalty to any one state, instead viewing the United States as a whole. He believed that the United States should become an industrial power and wanted a national bank to finance investments and improvements to the infrastructure for that end. Hamilton was also something of an elitist, believing that the people should be guided. Thomas Jefferson was a Virginian. He, like almost everyone at the time, was loyal to his state first and then to the nation. He wanted a weak national government, and believed that state’s rights were paramount. He believed that the United States should have a primarily agricultural economy and distrusted banks. His opinion was that only a republic of sturdy independent farmers could endure. He professed to have great love for the people. Even in personality the two men differed. Hamilton was hyperactive, always making plans and working on projects. Jefferson was more laid back, in some ways even lazy. In foreign policy, Hamilton favored an alliance with the British on the grounds of common culture and trade. Jefferson wanted to support France as a fellow republic after their revolution. The two men caused Washington quite a lot of trouble with their endless bickering, especially when the newspapers they were financing starting to attack each other. Soon the followers of Hamilton were calling themselves Federalists while Jefferson’s supporters were the Democratic-Republicans. The one thing that Hamilton and Jefferson did agree on was that Washington should run again. The country was still too young and things were still too unsettled to go without Washington’s guidance. Washington reluctantly agreed. All thirteen of the original states were able to participate in this election and Vermont and Kentucky had been added to the Union so there were 132 electoral votes. All 132 electors cast one of their votes for Washington, giving him a unanimous vote for President. 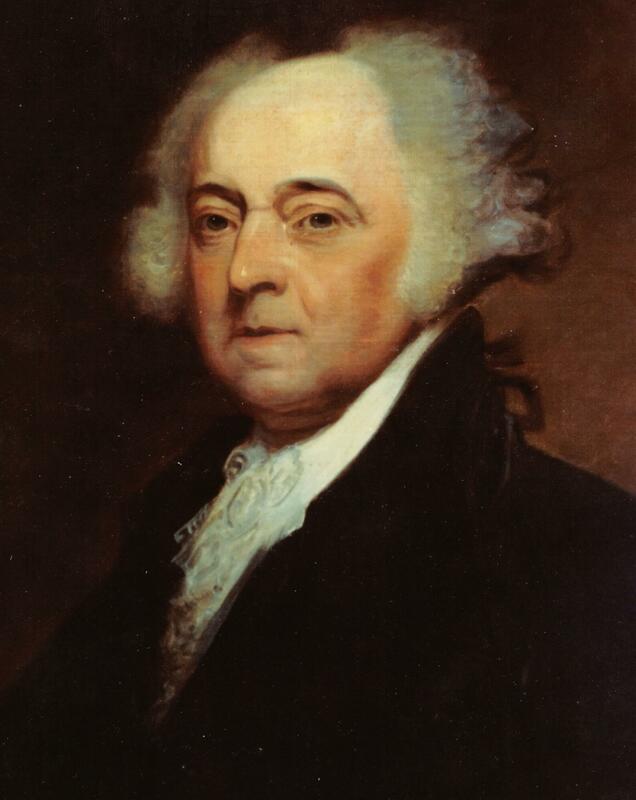 With their second vote, they gave John Adams 77 votes, making him Vice-President again. George Clinton received 50 votes. The election of 1789 was the first presidential election in the United States and it was unlike any election that followed. There were no debates, no campaigns, no popular vote and only one candidate; George Washington. The constitution had been ratified the year before by nine of the thirteen states. North Carolina didn’t ratify the constitution until later in 1789 and didn’t get a vote in this first election. Rhode Island held out until 1790 and likewise did not get a vote. The rules for electing the President were slightly different in the first four elections. Each State had as many electors in the Electoral College as the number of Representatives and Senators, just as is the case today. Unlike the procedure today, each elector had two votes and the candidate who had the most votes would be President, while the runner-up would be Vice-President.The seelction of the electors took place between December 15, 1788 to January 10, 1789. As I stated, North Carolina and Rhode Island could nor participate in this election and New York’s legislature was deadlocked and was unable to name any electors. So, only ten states participated. Of these only six had any form of popular vote at all, and the franchise was limited by property requirements. In most states, the legislatures either appointed the electors directly, or divided the state into electoral districts. In Maryland and Pennsylvania the electors were elected at large. In no case did any voter actually vote for the president. George Washington was the only candidate considered for the post. In fact, much of the debate over the Presidency at the Constitutional Convention had been shaped by the idea that Washington would be the first President. In a way, the job was designed to fit Washington. Washington was the most famous and popular man in America. He had been the indispensible man in the Revolution. He was well known in all parts of the new nation, and although he was from Virginia, he was not thought to be tied to any one section of the country. Of his contemporaries, only Benjamin Franklin could claim a similar national status. Franklin was too old, however, and although he had been a successful businessman, he had little experience as a political executive and none at all in military matters. difficult job of establishing a new government, especially since unlike all of his successors, he could not blame his problems on his predecessor. Washington was concerned that every action of his would be taken as a precedent and he was not sure he was up to the task of not just being the President, but of establishing the pattern of behavior for all subsequent presidents. 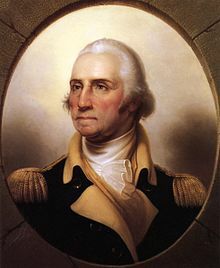 Washington had a strong sense of duty and was somewhat vain about his posthumous reputation so he agreed to be the first president. There was no suspense when the Electoral College met on February 4, 1789. Each one of the 69 electors cast one of his votes for George Washington, making Washington the only president ever elected by a unanimous vote. John Adams got second place with 34 votes and John Jay was a distant third with 9 votes. There were a number of other men who received a scattering of votes. “My country has in its wisdom contrived for me the most insignificant office that ever the invention of man contrived or his imagination conceived”. Everyone else was confident that this election would prove to be a bright beginning to the grand American experiment. I saw this at Walter Russel Mead’s blog, Via Meadia. Some 285 people were on board the ship, which sailed under her own power for 17 minutes, traveling a distance of 1,100 yards. Tugs were then reattached to Constitution’s sides and she returned to her pier by early afternoon. The ship, which doubles as a museum, receives more than half a million visitors each year. 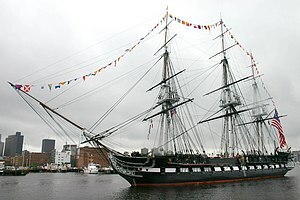 The Constitution is the oldest commissioned warship in the world still afloat. And although the United States is often called a young country, the American Republic is actually one of the oldest surviving governments in a world that often lunges from one revolution to the next. Here’s to many happy returns—for both Constitutions. We don’t often think of it, but if you look around the world, how many countries have the same government they did back in 1787. France was still a monarchy and fated to go through five republics, two empires and a restoration. China was an empire ruled by the foreign Manchus. Germany and Italy didn’t exist as countries. The only country with a constitution older than ours, that I can think of, might be Great Britain’s unwritten constitution. Even then, I think the British form of government has changed more than ours has over the last century. Japan has the world’s oldest royal family, but the politics of Japan under the Tokugawa Shogunate were significantly different than they were in the twentieth and twenty-first century. It is actually rather amazing that the United States is still ruled under the same basic form of government since we were only thirteen states on the Atlantic seaboard. Some might think that it is past time for a new constitution, but I don’t think we could ever be lucky enough to find people of the caliber of George Washington or James Madison, or any of the other founding fathers in this day and age. Lesser sons of great sires are we. I sometimes see people wearing t-shirts with a picture of Che Guevara on them. I guess they wear these because he was a “revolutionary”. Well, he wasn’t. Guevara was a tyrant, and murderer, and a thug. He headed Castro’s secret police and ran his concentration camps. His master, Castro, wasn’t really revolutionary either, just one of the many tyrants that have tormented humanity since the dawn of time. But, there were real revolutionaries more than 200 years ago. They led their country to freedom and changed everything. These are the men I want on my t-shirts.